7th January 2010. 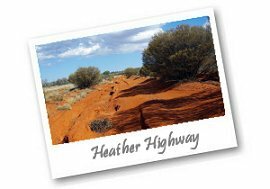 Welcome to the New Year from the ExplorOz Team, Find out the latest in Blogs, New 2010 edition 4WD map DVD, and 2 New Treks - Mereenie Loop and Heather Highway. Haven’t the noughties just flown by, we hope you’ve all had a wonderful holiday season, and have some great plans for the following year. Remember, whether you’re planning your next big trip, or looking for ideas, ExplorOz is here to inspire you and help you access the information you need to have an exciting 2010. Our office is back in action after its closure during the holiday period, and we’re back just in time to tell you about two fantastic new trek notes:Mereenie Loop in the NT andHeather Highway in WA, as well as some new and renewed business members for you to check out. 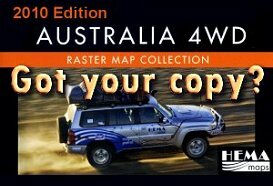 In our online shop, there is a brand new product release from Hema, theAustralia 4WD Raster Collection on DVD - 2010 edition, which contains some significant additions and updates. Also, the highly anticipated Outback Traveller’s Guides - theAnne Beadell Highway and theCanning Stock Route are available now. Want to tell your friends and family about all of your recent travels, and share your favourite pictures? Or do you want to catch up with what other ExplorOz members have been up to? Just go to the Blogs page. If you’re a member who hasn’t used Blogs before, we’ve made them even easier to create and navigate, so now’s the perfect time to give it a go! 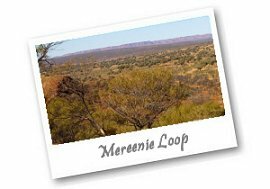 Mereenie Loop gives you the chance to view some of the Northern Territory’s most spectacular countryside. From the ancient and majestic West MacDonnell Ranges with its towering River Red Gums to the Watarrka National Park, which hosts the spectacular Kings Canyon, the track takes you on a journey through the vibrant rich red dune country that typifies the Red Centre. If you have a 4WD with good ground clearance, then this trek might interest you. The Heather Highway is a well signposted track accessible from both the Great Central Road and the Gunbarrel Highway. Named after the daughter of David and Margaret Hewitt, the track is located within the lower section of the Gibson Desert. Temperatures here can exceed 50°C in summer, so travelling during this time is NOT recommended. This remote trek is suited for experienced outback travellers with 4WDs (in convoy) that are extensively prepared. Best Off Road storage drawers are engineer designed to handle the harshest outback conditions. BluePrint Industries Pty Ltd is a WA owned and operated company specialising in 4x4 Accessories. Compressor Care Pty Ltd - boil water fast, in a quality-made stainless steel Royce Rimfire Bush Kettle.